I think Corey Crawford just let in another goal. It’s time for a change, but more importantly, it’s time for a spark. Crawford is not the Blackhawks’ biggest problem in their first-round series with the Predators, but it’s very possible that rookie goalie Scott Darling is the biggest solution. That’s a difficult thing to write. It reeks of complete panic, and that’s not what the Hawks are about. This a team that hits bumps, shrugs and bounces back. We’ve seen it over and over again. 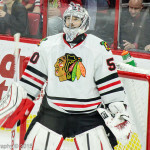 And Crawford helped keep the Hawks on track while they struggled during the regular season. Did I mention he has also won a Stanley Cup? But there’s something missing in this series, even if it’s only two games old. 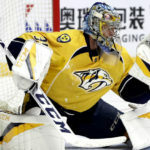 That’s not Crawford’s fault, though he wasn’t at all sharp Friday in a 6-2 loss to the Predators. The defense has been awful in front of him. But in four periods of work, he has given up nine goals on 47 shots. Those numbers speak the truth. This is a sport of feel and hunches and momentum, and none of it is in the Hawks’ favor in a series that is tied 1-1. 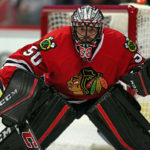 I fully supported the decision to go back to Corey Crawford for Game 2 given his playoff history. The above stats how nothing but the truth. I was wrong about that decision. For whatever reason… Crawford is not getting the job done. His confidence is shot. 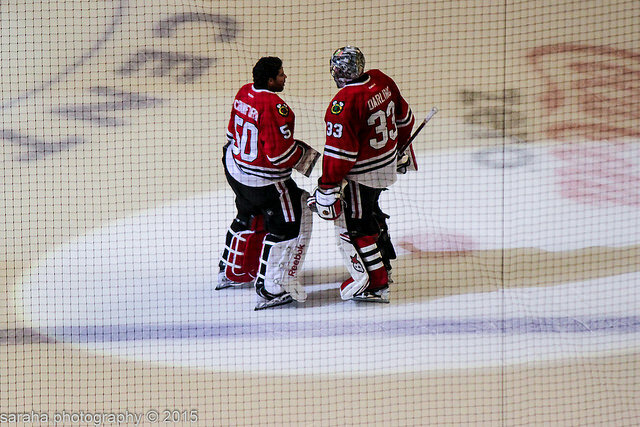 It is Scott Darling who sparked this team to victory last time out. who would’ve guessed the most veteran team at winning Stanley cups would be in this position so early? The backup really does give them the best chance to win this series. You have to give full marks to the Nashville Predators, for sticking to their systems. We will have to wait and see how this club responses without the assistance of the captain, Shea Weber. who will miss at least two games due to injury.